The improvement in the weather has meant a steady increase of members to The Gym. We have something for everyone, and with students slowly returning home for exams and holidays we also welcome them as members to The Gym. We have membership packages from age 15 upwards, all details are on our website, as are the details of our three awesome trainers. With our varied group classes we have something for all abilities. CLASSES WITH DAMON TAFATU – MONDAY 5.30pm Bodyweight Bootcamp, TUESDAY 9am Tabata, 3.30pm KidFit, WEDNESDAY 6am Tabata, 5.30pm Blast…. MumFit is on the 1st Wednesday of the Month at 10.30am, our last one for 2018 is on the 7 December. Damons classes are free to members and only $5 for non members, KidFit is $20 per term. GET MOVING WITH MISH McCORMACK – SATURDAYS 8am, this class is a perfect way to kickstart your weekend, a 45minute class consisting of cardio and strength, suitable for all abilities, as the weather improves this class will be outside. $10 or purchase a 10 class concession card for $90. CARDIO BOXFIT WITH KIMMY PERRIN – TUESDAYS 6.45pm – a fun cardio class that has you moving non stop for an hour, if you want to up the tempo of the class you can wear boxing gloves, bring your own or you can use ours, you will need wraps which we have available for $20 or bring your own. This class is $5 or purchase a 10 class concession card for $40. WORKING BEE – our annual Working Bee is held on Sunday 25 November, 10am to give the Rugby Club & Gym a good spring clean…if you would like to lend a hand feel free to pop down! We have a new addition to The Gym – a Precor Multi Press, the great thing about this machine is its actually 3 machines in 1 – bench press, incline press & shoulder press. If you haven’t been in to see our facilities feel free to contact one of our trainers to pop in for a look, we are very well equipped and new members are always welcome! A huge thank you to Matt Wood who has worked his magic so that all our membership can be done online, this will save a lot of time for everyone and trees! If you are interested in joining or renewing your membership go to www.martinboroughrugbyclub.co.nz (The Gym section!) Louise Henderson, our membership coordinator is always available if you have any questions. Everything you need to know about our trainers Damon Tafatu, Mish McCormack and Greig Rightford, as well as membership information can be found on our website, Facebook and Instagram pages. See you at The Gym! October has been a busy month and essential course improvements have been undertaken, the coring of the greens is a crucial process and every time they bounce back better than ever. Thanks must go to Trevor, Dayle and their band of merry men who have been doing huge voluntary work on the course. The forestry work down the 11th has gone to plan and changes the aspect of the hole considerably. More exciting news is the appointment of a new Head Greenkeeper Tim Bargh. He’ll start on 5th November. Tim is born and bred in South Wairarapa and is currently 2nd in command at Miramar Golf Club. The Men’s 72 and 36 hole tournament was played at the end of September. Results as follows: 72 hole best gross: 1st Cameron Elers, 2nd Troy Shaw. Best nett: 1st John Warner, 2nd Tora Boyne. The 36 hole best gross: 1st Caleb Kahui, 2nd Chris Ranish. Best nett: 1st Doug Clark, 2nd Ro Griffiths. Twos…too many to mention….27 in total!! Murray Halberg day was a stunning day, the men’s winner was Malcolm Wood 41. Nearest the pin Derek Stephens, twos: Derek Stephens, Craig Colton, George Kirk, Terry Fraei and Bill Jones. The ladies winner was Marie Scrimshaw 41. Nearest the pin: Cathy Taylor. Club champs have been the main focus for the ladies this month The Silvers had an epic battle seeing Debbie Donaldson and Kris Chamberlein going right up to the wire with Debbie winning by one putt on the 36th hole. In the Plate Jenny Wilkie and Carol Parkinson had to go to the 19th hole to decide their match. The Bronze A match was played between Bindy McLeod and Karen with Bindy coming out on top. Sylvia Beavis was the winner of the Plate. The Bronze B battle was between Lyle Griffiths and Angela Busby with Lyle’s greater experience coming to the fore. Sharon and Elaine Howe had a very friendly close match for the Plate but Elaine was lucky on the day. In the Vets division Pamela got the better of Mariana McDermott and Louise beat Jan.
Grumpies winners this month have included Rick Hargreaves, Gary Cuttance, Pete Price and Terry Blacktop. had by all, Katrina Burgess came in with the best score of the day, as well as celebrating her birthday! In the best nett and shoot-out earlier in the month Billie Holmes was the victor! Thursday club continues to get big numbers and winners have included, Rob Smith, Andrew Lawler, Gary Cuttance, Bill Gordon, Andy Pottinger and Julie Warner. ‘Smiddy’s Day’ annual tournament is booked in for 6th December. Hopefully November is full of fine weather and some fun times – good golfing everyone! Our Social Touch Competition has started up again, if you have not got a team entered then just pop down and either watch or if a team is short they may be looking for a reserve. Fridays from 5.45pm, a fun evening for the whole family, whether a spectator or playing! WORKING BEE – our annual working bee to give the Clubrooms and the Gym will be held on Sunday 25 November at 10am, this will be an opportunity to give everything a good scrub, all helpers are welcome as there will be jobs for everyone, many hands make light work! AGM – to be held on Monday 26 November, 7.30pm at the Clubrooms. This is an opportunity to get involved in the running of our Club, all members and supporters are welcome to attend. A massive THANK YOU to Trust House who have granted us $5,000 towards a new roof for the Clubrooms! After a few years of patching up our leaky roof it is time to replace, this Grant is a huge help in meeting the cost of this. Thank you Trust House! Also a big thank you to the NZ Racing Board who have granted us $1000 towards playing jerseys for our Sevens team. Each summer we enter teams in various competitions within and outside our region, it will be great for them to have their own playing kit. We recently said Bon Voyage to two of our valued players Chris Raymond & Cody Cunningham who have left for Irvine Rugby Club in Scotland for a season of rugby. We wish them safe travels and good luck for what lies ahead, and look forward to seeing them back for our 2019 season! I have recently moved to Martinborough with my wife Donna, and our daughter Abigail. 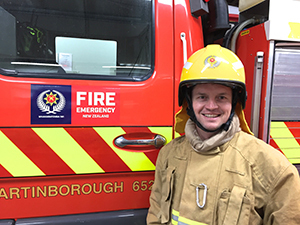 I have transferred into the Martinborough Volunteer Fire Brigade (MVFB) from the Devonport Volunteer Fire Brigade on the North Shore of Auckland. I grew up in Kapiti and have been visiting Martinborough for years so when the opportunity to move here presented itself, we took it. I joined the former New Zealand Fire Service (now Fire and Emergency NZ – FENZ) back in 2009 and have been firefighting on and off as my 13.5 years career with the Navy has allowed. I joined because I wanted to give back to the community in a fun, challenging and exciting way. It’s been an eye opening experience coming to a small town brigade from a big city. The scope of work that the MVFB does is so much broader; car accidents, fires, rescues and medical incidents just to name a few. We also have a massive response area including Lake Ferry, Kahutara, Ngawi and Tora, and because we are further away, it can take some time for other brigades, ambulances and police to get to us and help. This provides us some real challenges and means we have to keep on top of all our practical skills, as we could for example, be your medical first responder until an ambulance arrives. It’s a great group of people in the MVFB and if you are interested in volunteering, please come down to the station on Tuesday nights at 06:50pm and see what it’s all about. If you have an emergency and need help or you are ever unsure, just call 111. We will be there ASAP. Make sure you check the batteries on your smoke alarms. Time and time again they save lives. The sooner you can get out of your house and call us the better. For the men of the district. Make sure your BBQ and outdoor equipment is cleaned before use. It’s amazing where small animals and birds will make nests, and that combined with your previous cooking/cremation attempts can lead to unexpected fires and the brigade joining your party!